Glowcare is a family owned and run business established in 1992. We have a reputation for quality, reliability and friendly professional service. As approved Vaillant service agents, Glowcare are Gas Safe registered (formally Corgi registered) and offer a complete range of gas central heating boiler repair and maintenance services. We have a wealth of experience working exclusively on Vaillant ecoTEC plus and pro, Glow-worm and Saunier Duval boilers. Glowcare work from 8am to 8pm, Monday to Saturday, and cover most areas in North West England. Please see our Areas We Cover page, including Cheshire, Greater Manchester, Lancashire, Liverpool, Merseyside, North Staffs, and North Wales. Glowcare offer pre-arranged timed visits, including evening calls, so you take as little time off work as possible and are not waiting for us to come for hours on end. We are reliable – if we say we will come – we will! Our fair pricing policy ensures that no matter how long your repair takes, we only ever charge a one-off fixed labour price. This eliminates the anxiety of spiraling labour costs. 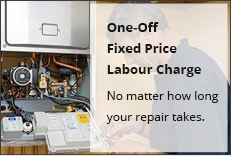 You can trust us to properly diagnose your boiler’s problem rather than part changing, which can prove very expensive. We carry a comprehensive stock of genuine parts with us, which ensures we complete a repair in one visit. Our customers are very important to us and we enjoy very good relations with our customers, past and present. Please see our Customer Testimonials page. We communicate honestly with our customers taking our time to explain what needs to be done and why, ensuring a satisfactory outcome. To discuss your Vaillant, Glow Worm or Saunier Duval central heating boiler requirements, whether it be boiler breakdown, fixed price repair or servicing do not hesitate to Contact Us. At Glowcare we are committed to providing long-lasting solutions – not just a quick fix.